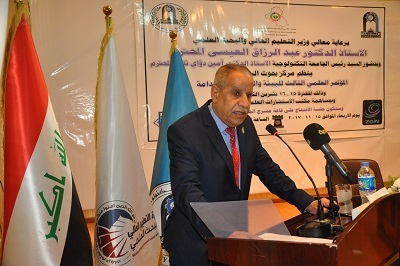 The Environmental Research Center at the University of Technology held the Third Scientific Conference on Environment and Sustainable Development for the period from 15-16 / 11/2017 at the University Theater Hall, in the presence of the President of the University of Technology, Prof. Amin Douai Thamer and his deputy for scientific affairs. 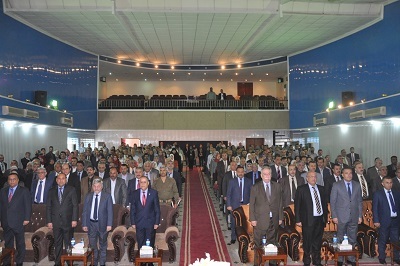 Dr. Sami Abu Al-Nun Ajil, Governor of Baghdad, Mr. Atwan Al-Atwani, Dr. Ibrahim Bahr Al-Uloum, Director General of the Department of Missions and Cultural Relations, Dr. Salah Al-Fatlawi and a number of heads of scientific and engineering departments and university faculty . The conference included multiple themes in environmental pollutants, environmental management and sustainability of natural resources and water resources. The conference began with the recitation of any of the Holy Quran, after reading Al-Fatihah on the lives of the martyrs of Iraq and playing the national anthem. The President of the University of Technology dewring his speech he said: The environment is of great importance in our daily lives. The concept of the environment has become more prevalent in society than ever before and everyone has a responsibility to protect and treat it. The environment has many challenges. In recent years, Across the Tigris and Euphrates Rivers and the drought that appeared on our country and a lot of desertification, which has obvious effects, as well as the existence of a lot of problems in how the recycling of waste and how to address, stressing that environmental issues are inevitable by the combination of many factors that contributed to the list of priorities Strategies of sustainable development and the size of pollution in contemporary life is more serious in its influential dimensions cause the increase in size and breadth of its geographical scope to threaten human life and various environmental resources and all living organisms, adding to the rich reconciling between sustainable development by the conservation of natural resources on the other hand, Of the existence of a joint effort between all state institutions, including the Ministry of Oil, Industry, Minerals and Health and falls on the Council of the province of Baghdad in about a year in addressing many of the problems that must be clear and clear through the research to be delivered at this conference. "Environmental Site Assessment for Polluted Locations in Iraq"
The fourth lecture was given to the working team for sustainable development in the Ministry of Planning and under the supervision of Dr. Hussein Ali Dawad entitled "Renewable Energy and its Role in Achieving Sustainable Development". The fifth lecture was given by Assistant Professor Dr. Hassan Katouf Jassim from the Department of Earth Sciences, Which qualified them in the production of electricity from wind power, and the lectures of the second day included 50 research distributed to the halls of the Center for Environmental Research in the Green Hall. 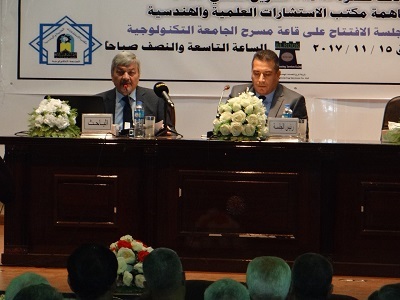 The first session was chaired by Dr. Fikrat Majid Hassan and Assistant Professor Dr. Saadi Mohammad Zaher. The course included 6 lectures. The second session was chaired by Prof. Dr. Abdul Razzaq Tarash Zaboun and Assistant Professor Dr. Sadeq Ahmed Qassem and discussed 6 researches, all discussed the topics of sustainable environment and wastewater treatment. The first session was chaired by Prof. Dr. Faris Hamoudi Al-Ani and Assistant Professor Dr. Ahmed Amin. The discussion included 6 researches and the second session under the chairmanship of Prof. Dr. Ibrahim Mahdi Azzouz and Assistant Professor Basim Hashim Faraj, They were all in English. In the halls of the blue hall, the first session was chaired by Assistant Professor Dr. Abdullah Saadoun Salman and Assistant Professor Dr. Halim, during which they discussed 7 researches, while the second session was chaired by Dr. Zineb Bahaa Mohamed.Dr. Rana Riad Khalil discussed 6 researches, either the workshop hall was the first session presided by Assistant Professor Dr. Tariq Abdul Hussein and assistant lecture Taleb Kamel Abd discussed during the seventh research and the second session under the chairmanship of Assistant Professor Dr. Mahmoud Mehdi Preuti and lecture Afaf Abdul Rahman Ayoub as a Rapporteur included a discussion of 6 research sessions In the end of the conference, the final speech was delivered by the Director of the Environmental Research Center, Assistant Professor Abdulhamid Mohammed Jawad. The certificates were distributed to all researchers participating in the conference proceedings.